Provide good protection from electromagnetic interference (EMI) or reduce electromagnetic radiation (EMR) from supply cables. Fine copper conductor with PVC insulation and a combination of pliable oil resistant PVC inner and outer sheaths result in excellent flexibility, and the tinned copper wire braid provide an effective screen. Use in general wiring in machine tool applications especially in conjunction with PLC or microprocessor controlled manufacturing. Fine copper wire strands to IEC 60228 Class 5. 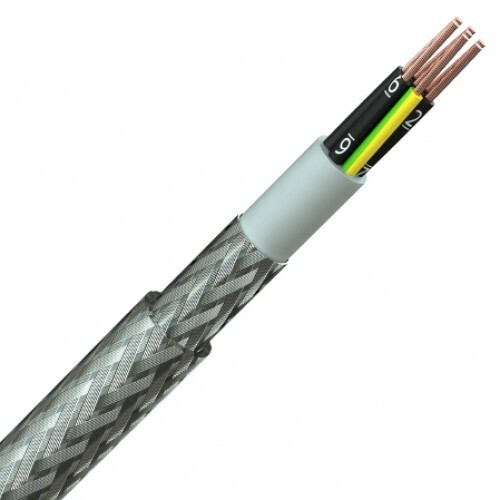 Black PVC insulation with white numbers, a green/yellow earth conductor in cables with more than 2 cores. (Coloured core identification versions also available). Cores twisted together. Grey PVC inner sheath, tinned copper wire braid, clear PVC outer sheath.